“Where Trees Are Planted Like Heartbeats” 16″ x 28″ x 1.5″ oil on wrapped canvas (painting continues around edges). SOLD. Prints available. “An Opportunity to Yoke” (or to cover with consciousness). 32″ x 48″x 1.5″painted edges. Oil on Canvas. $2,200. Prints available. “Big Dream Under the Hill- smoke swirls” 5′ x 5′ oil on canvas. Commissioned. Prints available. “Along a Moving Horizon” 32″ x 32″ oil on canvas with wrapped/painted edges. Prints available. “Wandering Road to Open Sky” 20″ x 40″ oil on canvas. Prints Available. 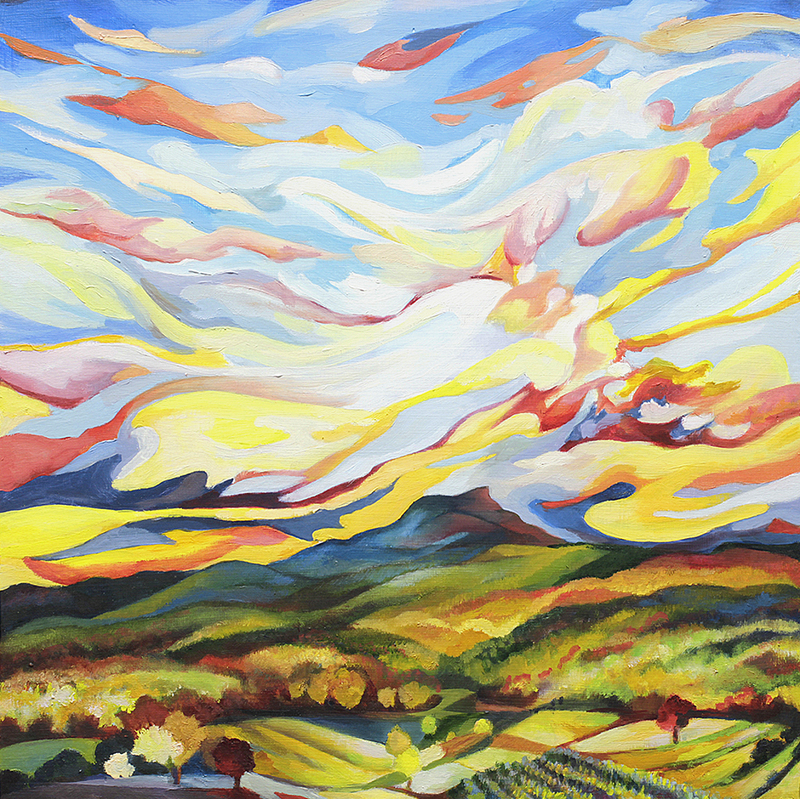 “Green Mountain Valley” 32″ x 32″ oil on canvas. Prints Available. “Fields After June Rain” 32″ x 48″ oil on canvas. Prints Available. “In a Hidden Place” 55″x 55″ oil on canvas. Prints available. “Lifted By Day, Suspended by Night” 50″ x 60″ oil on canvas. Prints Available. 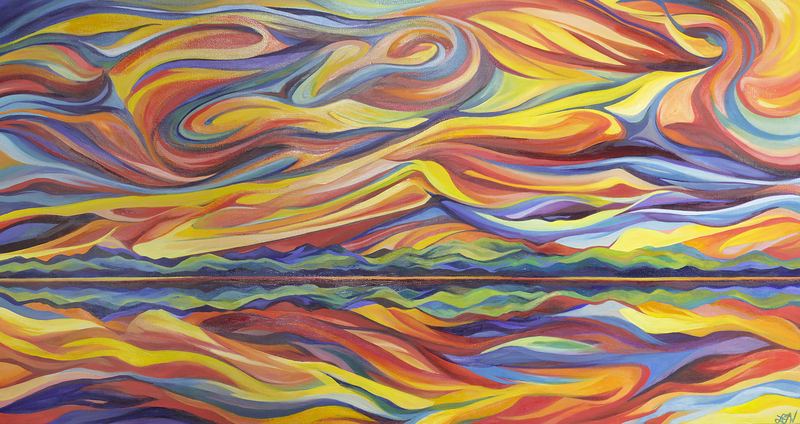 “Summer day Solstice from Greenbush Road” 24″ x 72″ oil on canvas. Prints available. “Burlington Summer” 32″ x 32″ oil on canvas. Prints Available. “Lake Memphragog Winter” 32″ x 46″ oil on canvas. “Red Barn Summer” 18″ x 24″ oil on canvas. Prints available. “Copper Mountain Vista”14″ x 50” oil on birch. Commission. Prints Available. 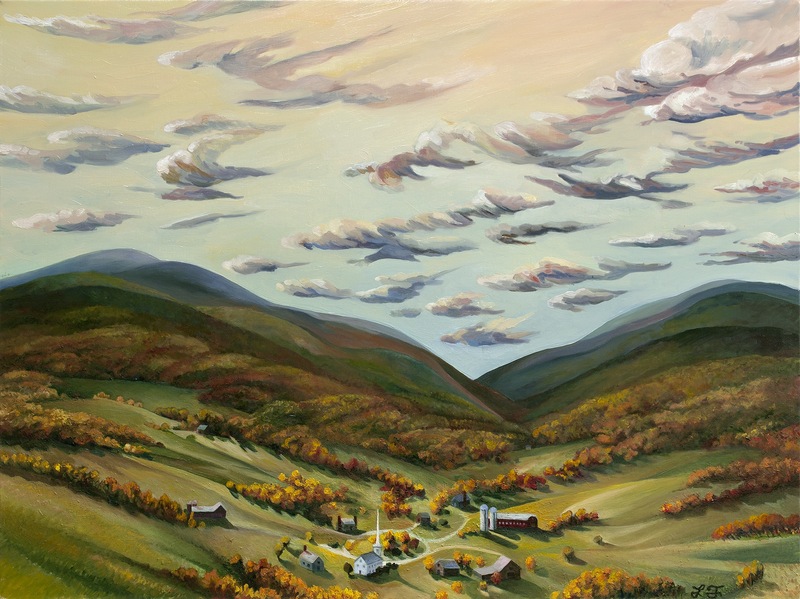 “Eastbound in the Green Mountains” 30″ x 40″ Oil on Linen. Commission. No prints available. “Rose Marigold Tango Over Lake Champlain” 40″ x 60″ oil on canvas. Commission, no prints available. “Sunburst Over Camel’s Hump” 16″ x 16″ oil on birch. Commission. Prints Available. You should be hanging in the Smithsonian. Every painting seems to capture the moment not just visually but emotionally. I can’t say that I feel what you did when you saw it, but after after seeing how you express it, I feel like I do. I’m a broke musician myself, but if my wife and I could invest everything we had in your career we would. Unfortunately, there’s food, clothing, shelter and most importantly..our art to keep going. Good luck. You’re a blessing to everyone with eyes and a heart to guide them. I am so moved by your words: your perspective and encouragement to keep sharing-exploring-expressing within the trusted stop-go-and-flow of the artistic within me. Thank you for letting me know how it has affected you, for the better. I have no doubt your music does the same in its own right. -Blessings to you both!